Over the month of August, Tradecorp was present at Expo Agrofuturo 2018 in Bogota, (Colombia), where we presented our latest innovation, IsliFe 8.2. IsliFe 8.2 is a unique product: the first biodegradable iron chelate that is stable under alkalinity conditions. At Expo Agrofuturo 2018, visitors had the opportunity to learn more about IsliFe 8.2, a novel iron chelate that corrects and prevents iron deficiencies even in unfavorable conditions, such as calcareous and alkaline soils with extreme pH conditions. 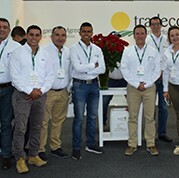 Participants could also meet the Tradecorp technical team to receive personalized technical service, discuss their concerns and doubts and learn how to maximize their crops’ quality and yield. Expo Agrofuturo 2018 took place on the 22, 23, and 24 of August in the Corferias convention center of Bogota, Colombia. Being one of the most important conferences for the agricultural sector in Latin America, it was a perfect opportunity for businesses to meet suppliers, producers, and others from the product chain.